Q. What does Tom Maxwell use to polish silver? Q. What is the best way to polish silver? I hear people have different methods. Q. What exactly is tarnish, and what can I do to slow down tarnishing of my silver? Q. Does having monograms/initials on my silver lower its value or affect saleability? Q. Should I polish my silver before bringing it to Maxwell Silver at a show or before shipping it to Tom by UPS or USPS? Q. What determines the value of a piece of silver? 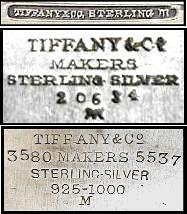 Q. I understand there are "makers marks" stamped on pieces of silver. What is the purpose of them, and how does it relate to the price of my silver? A. Wright's Anti-Tarnish Silver Polish, LIQUID only. It comes in a tall 7 ounce plastic bottle that can be purchased at most supermarkets for about $5.00 per bottle. Most carry only the paste, but you should try several to find one that carries the liquid. You can even find it on Amazon and eBay, though at a slightly higher price. Most people use Wright's paste that comes in a round tub. The paste is often caught in fancy or pierced patterns and – despite what Wright's says – the paste is abrasive. (In fact, I can see the swirls (light scratches) in the silver pieces polished with that product. One can actually see the direction one polished the piece! A. Do NOT follow the “home remedies” for silver preservation and polishing. Simply because it looks bright and shiny doesn't mean it isn't damaged! Do not use gimmicks such as Tarn-X or the aluminum trays that one immerses silver in with a mixture of hot water and baking soda or the like, as these methods often do more harm than good! The chemical process (ex. Tarn-X) strips the black or patina from the silver, leaving the silver dulled or lacking the contrast essential to spotlighting the pattern. It WILL clean the silver but you would still require a good silver polish to make it lustrous. This quick remedy does not seem to harm the silver, but the cons outweigh the pros. Always polish silver back and forth in a line, then around in a circle. Use a DRY cotton washcloth or cotton towel. Polish the silver by applying silver polish to the cloth, rubbing vigorously, then rinsing in hot, soapy water. Rinsing your piece in clean hot water, and dry with a cotton towel (Get a fresh, dry towel when it becomes damp) Finally, leave the silver out to air dry and come to ambient temperature. Use a rubber mat in the sink water to prevent silver getting scratched by the basins. When polishing lots of silver I prefer to put my hand in an old cotton sock, squirt polish on the sock and wipe with that. I can do lots of silver faster and with better control of the pieces. Pitch the sock when finished or wash it separately from regular clothing. A. Over time, sterling silver, silver plate, and coin silver will tarnish. The surface of the silver gradually transforms from a bright and shiny appearance, to a light yellow or gray. (SEE LEFT IMAGE) Over very long periods of time, if not polished, it can become black or purple. The straw color or brownish black color that appears on silver is caused by sulphur combinations in the air. On the plus side, this corrosion occurs only on the outer surface and does not harm the silver. Air contains trace amounts of hydrogen sulfide and it has a natural affinity for silver hence the chemical reaction that tarnishes your silver slowly. Silver can tarnish very quickly with direct exposure to anything rich in sulfur containing substances. Examples are egg yolks, rubber bands, felt, wool, natural gas or coal from your heating units, paper, matches, mustard and an almost endless list. If you live in a home that has natural gas or coal, your silver will tarnish more quickly than an electric home, as natural gas and coal release sulphur when burned. Avoid having your silver coming in contact with paper, matches, rubber (rubber bands). Food remnants that are high in sulphur should be rinsed off your silver as soon as you have finished using them. Such foods include egg yolks or mustard. Always rinse silver off especially if you plan to thoroughly wash the dinner dishes in the morning. Gravy, soy sauce, sauces, toppings, etc. usually contain a lot of salt. Salt pits silver, as well as stainless steel such as knife blades. Pacific Silvercloth wraps for individual pieces of silver and silver chests lined with this cloth greatly slow tarnish, as they are impregnated with millions of tiny particles of silver that trap tarnish gases before they can reach your silver. We leave our coffee/tea service out all the time and drape it with a single piece of this cloth that we purchased from a fabric store. It keeps the dust off and the sulphur attaches to the cloth and not the silver. We simply pull the cloth off when company comes over; we use no bags, zippers, etc., simply the loose cloth. Use your silver! The actions of using, washing and drying it retard tarnishing. Rotate usage of pieces so that all pieces are in service. After washing and drying your silver leave it out to air-dry before putting away. Letting the silver come to ambient room temperature before storage reduces tarnishing. 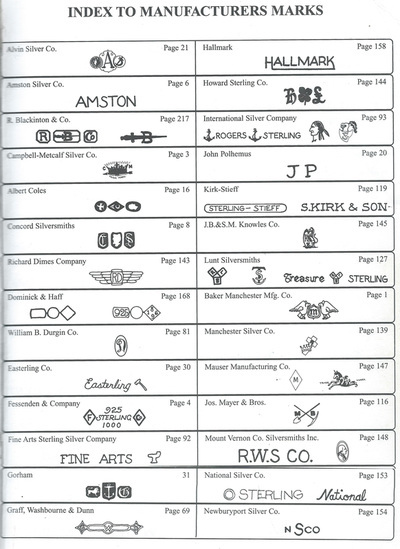 Serious collectors will usually buy monogrammed/initialed pieces if their pattern is difficult to find or obtain. Some collectors will only accept monograms or initials (M/I) on rare or hard to find pieces. Others will accept M/I only if the letters or dates match family history or are significant to the collector. A smaller percentage of collectors will simply not collect anything with monograms; a shame, since old silver was usually beautifully hand-monogrammed. 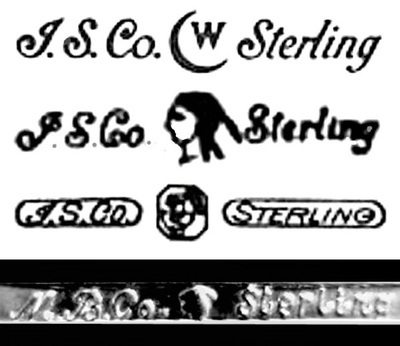 Almost all Victorian patterns provided a space such as an oval or shield or other empty field where the proud owners could have their initials engraved. On very fancy repousséd patterns where one could not monogram the front of the handle, owners monogrammed the back of the handle, which was usually devoid of ornamentation. Still others chose to monogram the inside of spoon bowls. The initials also provided some degree of protection against theft. 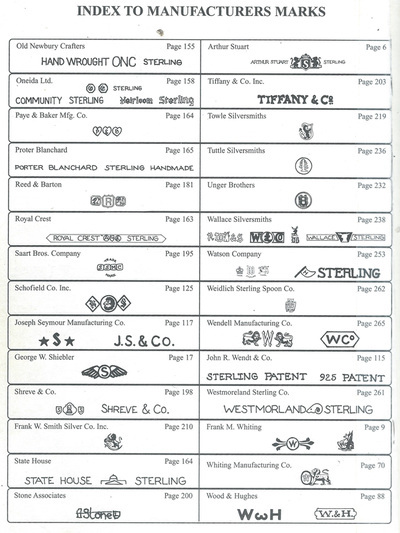 On common patterns such as Gorham's "Chantilly", "Buttercup", "Strasbourg" and Reed & Barton's "Francis I" and other popular patterns with long production histories, most collectors do not accept m/i especially on common basic pieces as the patterns have been made for over 100 years and are still made. Since there are so many pieces available collectors do not feel compelled to accept m/i pieces. Monogram REMOVALS -- whether done by amateurs or professionals -- generally lower the value or make it very difficult for one to sell. Maxwell's Silver Matching Service will not purchase monogram removed silver, but for only in rare cases. I personally prefer monogrammed silver over non-monogrammed as I appreciate the hand engraving as they often make pieces look complete and loved. Q. Should I polish my silver before bringing it to Maxwell Silver at a show or before shipping it to Maxwell Silver Matching Service by UPS or USPS? A. No. I would greatly prefer you just bring your silver piece to me or ship the silver “as is.” If it is tarnished, it will not affect the amount I pay for the piece. Please just bring or ship the silver without polishing. It is very interesting that what the Victorians perceived as beautiful is pretty much what we today feel is beautiful. A large percentage of today's most popular patterns were first introduced over 100 years ago. In fact, for you convenience, we've put together a list of some of the more popular patterns we deal with, right on our "Available Patterns" page, with more information about patterns themselves! A. The starting point to understanding the origin, pattern and value of a piece of silver whether it be sterling silver, silver plate or coin silver is the maker's mark. 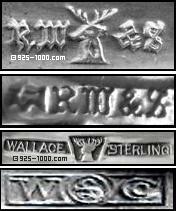 Each company had a distinctive mark or marks and often a whole series of marks if they produced silver over long periods of time. Some makers of silver would command more of a premium price than other manufacturers. 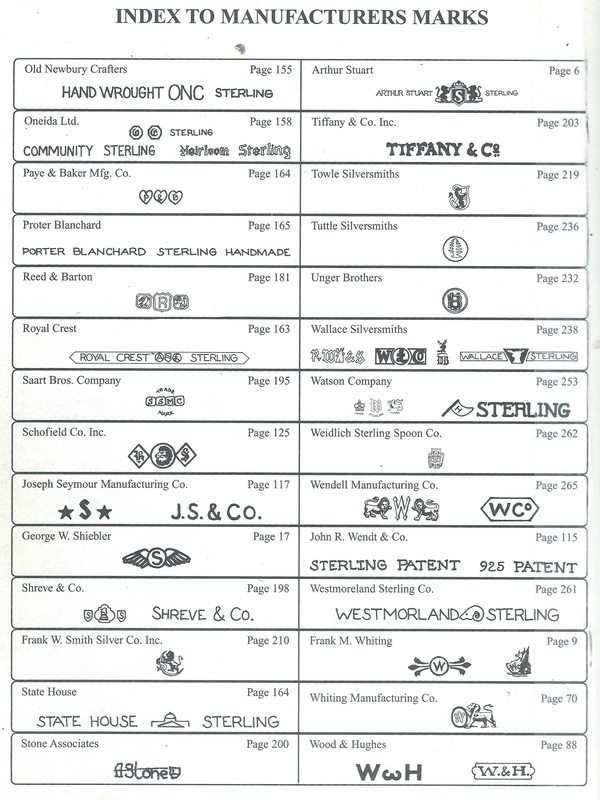 Examples would be Tiffany & Co., Albert Coles, John Polhemus, George Sheibler and Unger Brothers. 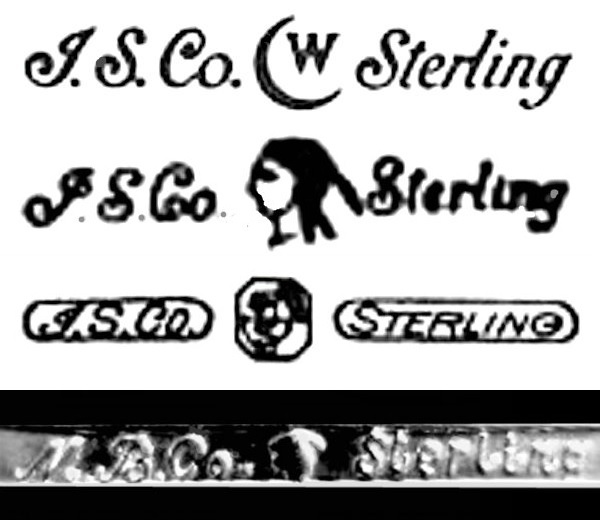 Hand wrought silverware by companies such as Stone Associates, Porter Blanchard, Randahl Shop, Allan Adler, Kalo Shop and Old Newbury Crafters are very expensive. Individual patterns by various companies can be highly sought after and are thus quite expensive. 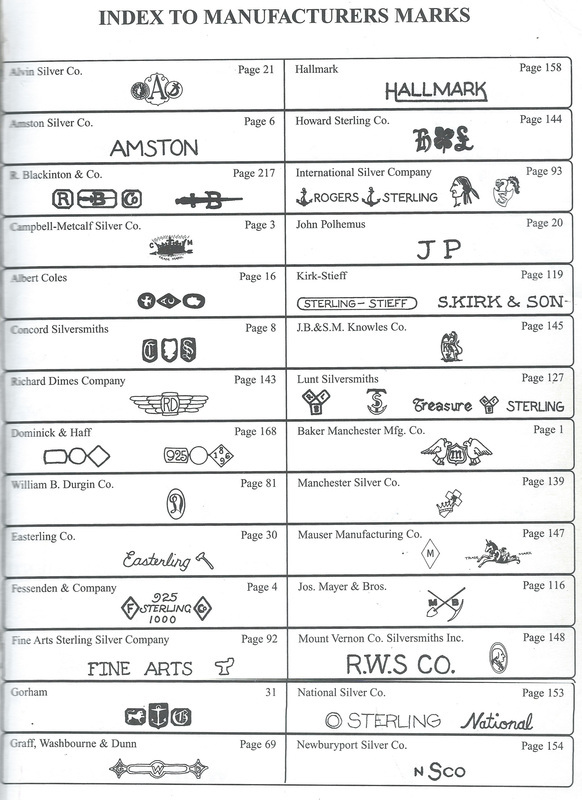 To learn about a sterling fork you inherited from Aunt Mabel (which looks like Picture #3 above), go to the the Index to Manufacturers' Marks in Sterling Flatware, Revised Second or Third Edition by Tere Hagan. (Already in our Recommended Reading section). Find the name or symbol(s) to get the name of the maker of this fork. In this case, the symbols stand for Gorham Mfg. Co. of Providence, RI. To get the name of the pattern and the year it was first introduced, go to the Gorham section and match Aunt Mabel's pattern with the picture in the book.